Bread? As a salad? Yes Yes and Yes! Who doesn't love croutons? Why not just skip over the whole green leafy part for a change and make the croutons the star of the show. 1. 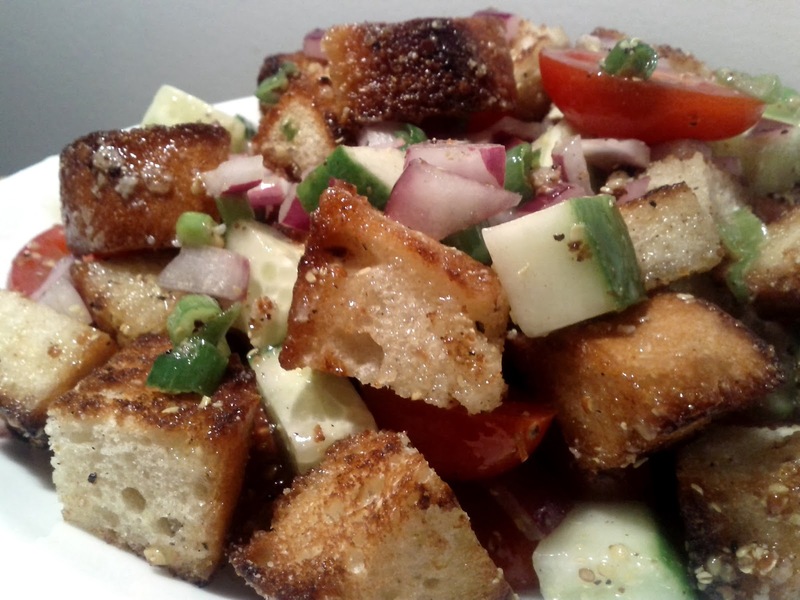 Slice bread into good size cubes, which will be the big juicy croutons of the salad. 2. Chop cucumber, tomato, red onion into bite size pieces to be mixed with bread. 3. Heat some oil in a pan, and once its hot, toast your bread cubes in it. Toss around the cubes to make sure they don't get burnt and that each side gets slightly brown. 4. While the croutons are still warm. Season with salt, pepper, and garlic powder. 5. Mix bread with diced up vegetables. 6. Add in your salad dressing made from oil, vinegar, salt, pepper, dijon mustard. Or whatever salad dressing you want but preferably oil and vinegar.